I feel like it's been ages since I've done a haul, probably because with paying for all of my degree show bits and pieces the purse strings have been extremely tight for the past couple of months! I haven't browsed Boots in so long, although TK Maxx is still my home away from home! So for the bits I pick dup in Boots, I repurchased my Soap & Glory Supercat Liquid Eyeliner, it's still one if the best I've ever used! I also picked up some super exciting things from NYX. We've just got NYX counters in Boots and I couldn't resist popping in, I've got a whole review and swatches post coming in a couple of days so stay tuned for that! 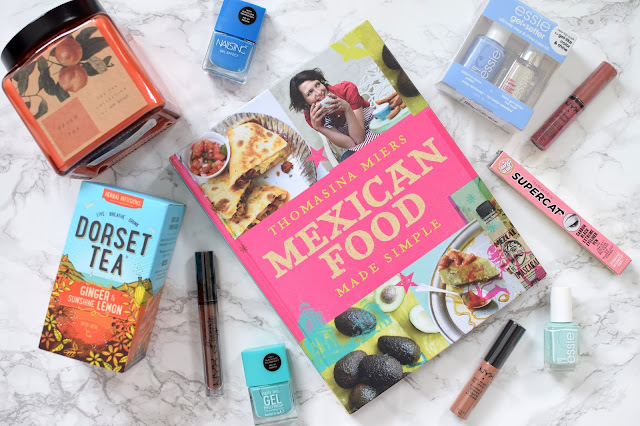 Onto TK Maxx, the first thing I picked up was Mexican Food Made Simple by Thomasina Miers, this was reduced to £5 and me and my boyfriend love Mexican food and this has some super yummy recipes in. Staying with the foodie theme I also picked up a box of Dorset Tea in the Ginger & Sunshine Lemon flavour, I was admittedly drawn in by the lovely box but I've had some and it's really nice! For beauty bits I picked up some nail polish, I've got this pact where I'm going to gradually buy better quality polishes like Essie and Nails Inc. Although I'm not paying £8 a bottle! So I like to keep my eyes peeled in TK Maxx. I picked up a set with Essie Bikini So Teeny and a gel top coat for £9, Essie Mint Candy Apple for £3, Nails Inc Gel Effect Polishes in Soho Place and Mercer Street, only £3 and £1! Finally you all know I can't resist a candle and I'm absolutely obsessed with it already. I love DW Home candles and would definitely recommend the brand if you see it, this one is Peach Tea scented and it's the perfect mix of fruity but still creamy and sweet, almost slightly cakey, so good! TK Maxx have so many amazing things, looks like you picked up some bargains!